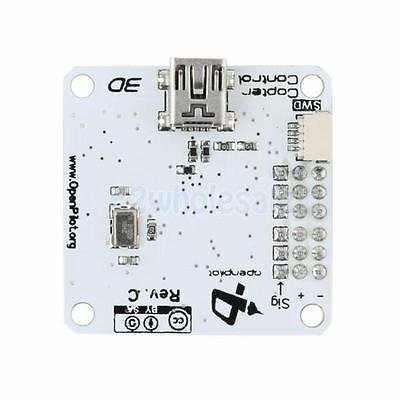 CC3D Openpilot Open Source Flight Controller 32Bits Processor for quadcopter by e2wholesale at Open Drone. Hurry! Limited time offer. Offer valid only while supplies last. with its core design principals being quality, safety, and ease of use. Simplicity does not come with any compromises either: with no hard-coded settings, a complete flight plan scripting language and other powerful features, OpenPilot is an extremely capable UAV autopilot platform. CC3D CopterControl Hardware Features: Powerful STM32 32-bit microcontroller running at 90MIPs with 128KB Flash and 20KB RAM. 3-axis high-performance MEMs gyros and 3-axis high-performance MEMs accelerometer. Tiny 36mmx36mm 4 layer PCB for superior electrical noise reduction and flight performance. Software support for Windows, Mac and Linux. Direct high speed USB support with no drivers required, a truly plug and play device. Spektrum satellite receiver support. Futaba S-BUS hardware support. Innovative Flexi-port technology for superior port flexibility. 4Mbits on-board EEPROM for configuration storage. Flexiport: CopterControl also offers the innovative Flexi-port which provides either I2C connectivity or a second serial port. Flexi-port gives CopterControl the flexibility to use either I2C and a single serial port or dual serial ports, according to your connectivity needs.